Dead of Night 11, Page 15. One of my all time favorite Marvel characters is the Scarecrow, not the lame guy with a pitchfork but the creepy cool guy who appeared in Dead of Night #11, Marvel Spotlight #26, and Marvel Two in One #18. Okay, he had a couple later appearances in Dr. Strange, but please let's forget those. Through these three appearances, the guy was interesting, creepy and fun. While someone keeps trying to push the cover of MTIO #18 for sale for an ungodly sum, this Scarecrow appearance was relatively affordable and has a really nice "horror comics" vibe that most of my pieces lack. I'm really very excited to have this Scarecrow appearance hanging on my wall! This was purchased through EBay in February of 2006. This is a digital photograph taken through a frame - I usually use the seller's scans, this one was awful, and I forgot to scan the work myself before having it professionally framed. My apologies for the quality! By the by, I got to write the Scarecrow (later renamed the Straw Man) in Marvel's 2005 Horror book, and they overrode my image choice for him in favor of one they already had from the MTIO Essential. Since the image I selected is just creepy great, when Marvel.com start putting character bios online I went ahead and uploaded it there. 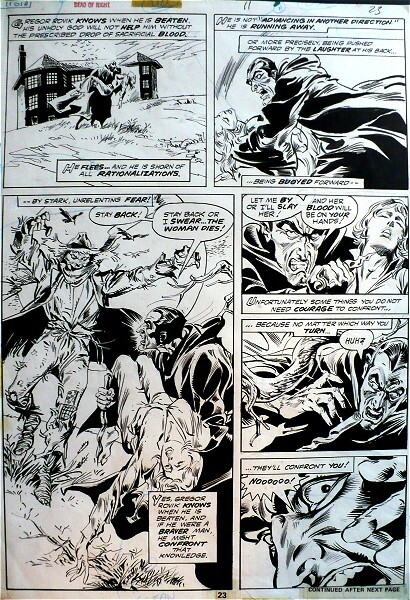 For a good grasp on the Scarecrow, check out the picture and profile at Marvel.